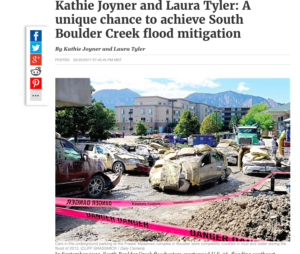 The South Boulder Creek Action Group is delighted to let you know that Boulder’s Water Resources Advisory Board passed a series of flood mitigation recommendations last Monday that we wholeheartedly support. Council will hear these recommendations at their hearing on August 7th. Here’s a summary. 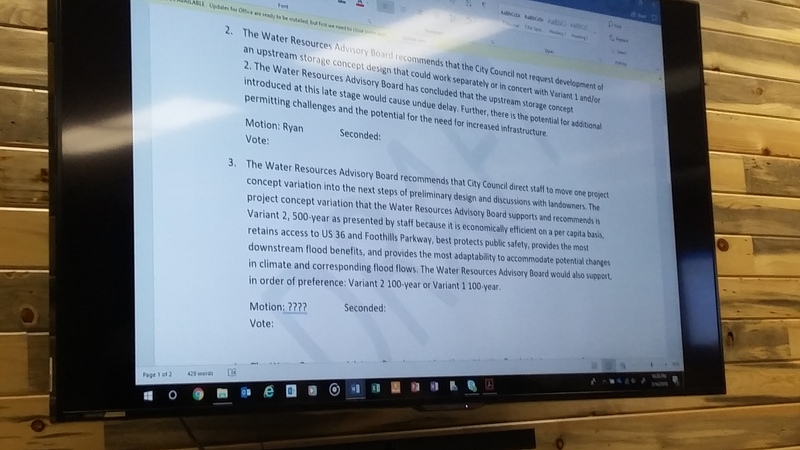 Click the screen shots below to read the full text of each motion. Take the Master Plan Option (formerly know as Option D) off the table. 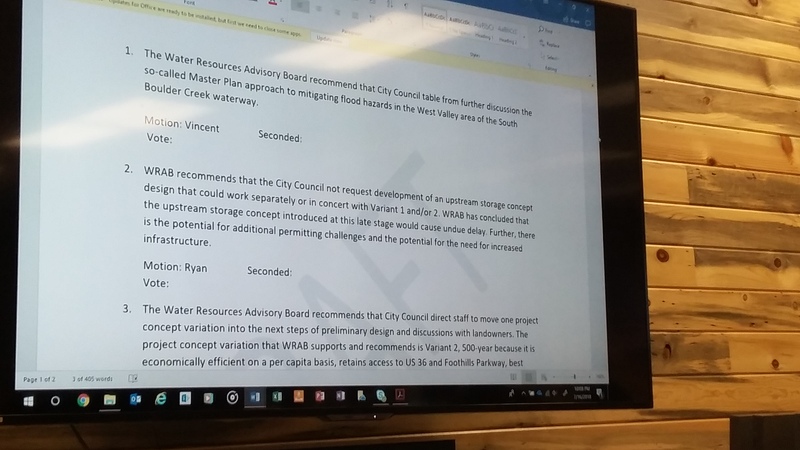 Take the Upstream Option (citizen generated design recommended by OSBT) off the table because it involves too much delay, is too costly, and has significant permitting issues. Recommend Variant II, 500 year design as the preferred option; followed by Variant II, 100 year; and Variant I, 100 year. By recommending a 500 year design as preferred they realize this is unprecedented and not achievable on future flood mitigation projects. Still, they think the benefits are worth it in this instance. Join us at City Council on August 7th, 2018 to support these recommendations! This entry was posted in News on July 26, 2018 by Tyler. 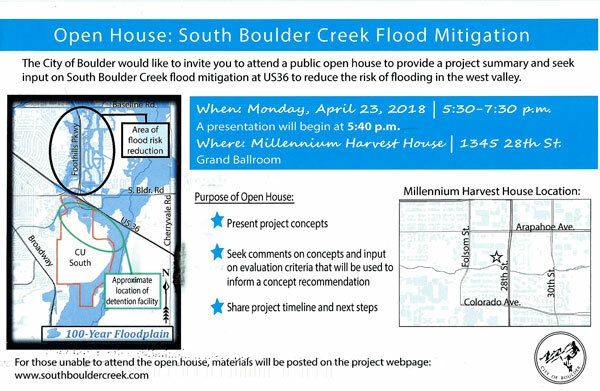 On Monday, April 23rd the City of Boulder’s Department of Public Works is hosting an Open House: South Boulder Creek Flood Mitigation. See NEW project concepts! Comment on concepts. 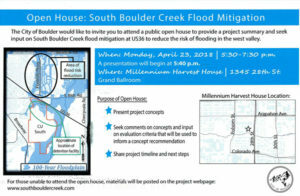 Let the City know you support flood mitigation for our neighborhood. We wholeheartedly encourage you to attend this meeting and urge the City to keep prioritizing safety in our neighborhood by moving this project along. This entry was posted in News on April 18, 2018 by Tyler. Important public hearing, Tuesday, May 23rd! We urge you to attend this important public hearing. THE PURPOSE OF THIS MEETING is for City Council and Planning Board to hear citizen feedback about proposed updates to the Boulder Valley Comp Plan including the annexation of CU South for flood mitigation. IT IS IMPORTANT BECAUSE: While the City has a plan to provide flood mitigation for our neighborhood, they won’t implement it without visible public support. Join us in supporting our City Council in providing flood protection for our neighborhood! This entry was posted in News on May 15, 2017 by Tyler. Here is a list of City of Boulder hearings, study sessions and other events created to address proposed changes to the Boulder Valley Comprehensive Plan (BVCP). The BVCP updates must pass in order for the City to provide flood mitigation for our neighborhood. Save these dates, attend the meetings, and make your voice heard! This entry was posted in News on March 31, 2017 by Tyler.